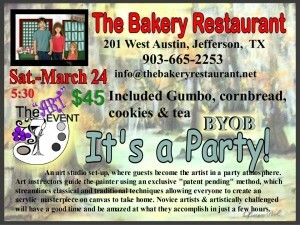 The Bakery Restaurant is hosting the ART Event on Saturday, March 24th beginning at 5:30 pm. Join in on the fun of creating a painting painted by YOU. Will yours be a Monet or a Picasso? A class the ART Event did in January 2011. From reading their Facebook page and looking at all the pictures of previous classes it looks like an experience you won’t soon forget. 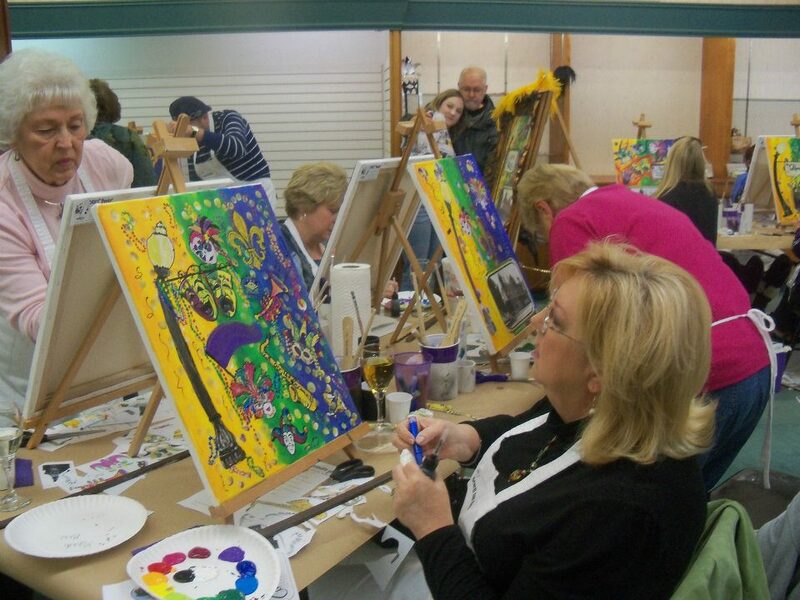 What a better way to enjoy an evening than eating dinner, having a few glasses of wine with friends and painting your masterpiece. 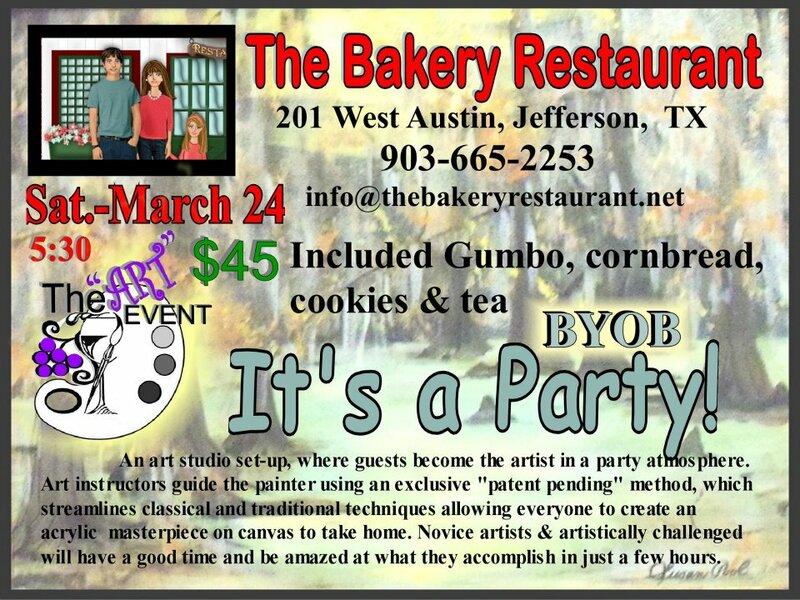 A team of art instructors will guide you using a patent pending teaching method which streamlines classical and traditional techniques allowing novice painters to have a good time and be amazed at what they can accomplish in just a few hours. 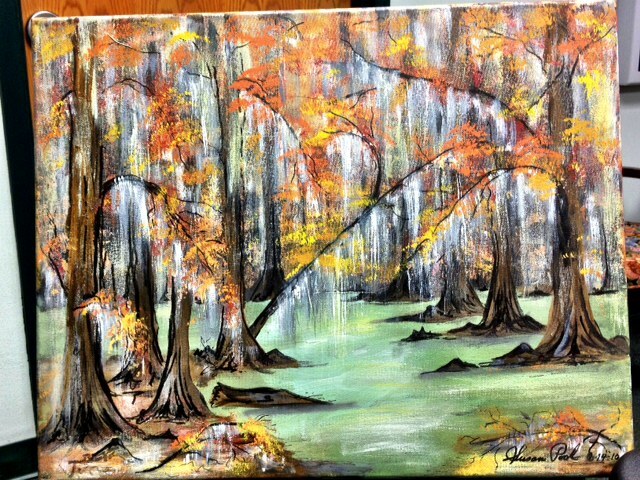 We will be painting a scene called “Ron’s Caddo”. All supplies are furnished. Photo of painting “Ron’s Caddo” taken by Tammy Doriot at the Jefferson Transportation & Visitors Center. Chicken and Sausage Gumbo will be served. Bring your own wine or drink of choice (tea provided) $45 Must preregister/prepay. Arrive at 5:30–get your apron and have some gumbo. Painting begins at 6pm. 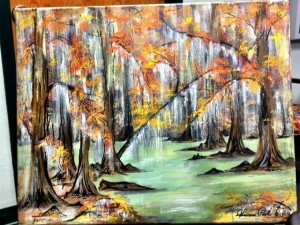 This entry was posted in Paintings, Special Events by Tammy D. Bookmark the permalink.